Sode kites are less known than Sleds or Diamonds, but fly really well due to their cambered sail. I made at least 2 of these as part of the 1-Skewer Series, with clear plastic sails. A very long but light tail kept the tiny kites stable. The 1-Skewer Sode flies over a very respectable wind range, and has a characteristic fish-like wriggling motion in the air. 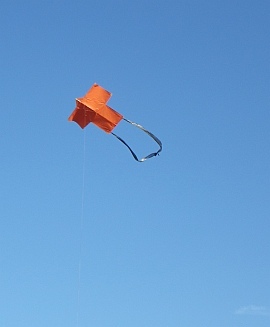 More recently, this kite has been made more visible by doing the sail in orange plastic and using a simple ribbon tail made from black plastic. Despite some dihedral in the design, this little Sode still requires quite a lengthy tail. It looks good in the air though! Almost like a little model aircraft towing a banner. Next up in size comes the 2-Skewer Sode, which prefers fairly light winds. 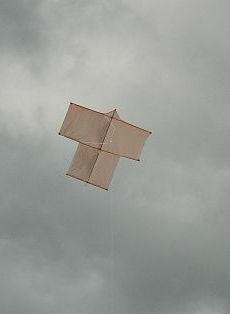 A wonderful kite to fly in light wind and thermals! Finally, we started making larger kites like the Dowel Sode. 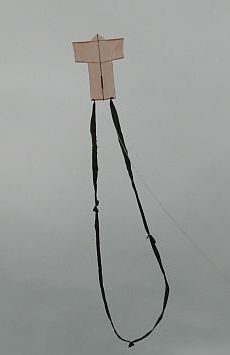 This kite has a 4-leg bridle, which keeps the kite very steady and predictable most of the time. Wind gusts accelerate the kite quickly and smoothly. Placid in smooth air, but prone to charge this way and that in gustier moderate winds! Quite an interesting single-liner to fly. Down below is a photo or 2 and a video for all the MBK Sode kites. This illustrates the end result, in case you decide to use our instructions to make one of these kites. Our first 1-Skewer Sode saw quite a lot of flying, in a range of weather conditions and locations. Its first flights were in very light wind, and we took a few close-ups at that time. See the photo over there! The tiny Sode gamely remained airborne, zipping violently from side to side in wild figure eights that took it close to the sand. Somehow, it survived to fly another day! 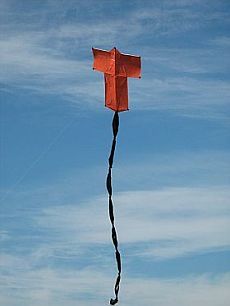 Here's the latest version of the 1-Skewer Sode kites, in orange garden bag plastic. The tail is cut from a cheap black garbage bag. The looped tail gives the kite more stability than if the same length was allowed to just hang by one end. Check out the video below, which shows this kite weaving its way up to a very respectable line angle, in a moderate breeze. Some extra tail was added due to the extra wind strength. The 2-Skewer Sode is, as the name suggests, exactly twice as tall as the 1-Skewer design. This gives it 4 times the sail area with not much more than double the weight. Hence, it doesn't need quite as much wind as the smaller design. 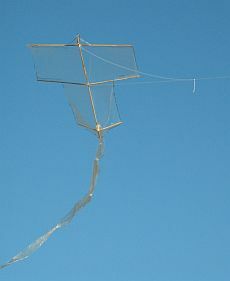 The kite pictured has 2-ply plastic which makes it a little heavier, but it still flies great. A few times we've had this kite floating around near 400 feet altitude, on a 20 pound Dacron line. When the wind strength gets too high, the Sode starts to lazily loop in one direction, but recovers after reaching a lower height where the wind is slower. More recently, another 2-Skewer Sode has been constructed, featuring more traditional proportions and a looped tail. See the photo. It looks almost like an aircraft in flight. A very efficient flier in light to moderate winds. The video below shows the original 2-Skewer Sode on a short line in a light breeze. Being close to trees and other obstacles, the wind has plenty of turbulence. See the Sode descend a couple of times as the wind speed suddenly drops to near zero! 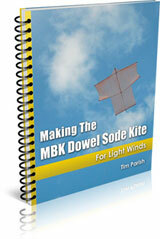 The largest of the MBK Sode kites, the Dowel Sode. The first one we made had some flaws, and it didn't get many flights before I finally made a second one with the necessary improvements. There it is in the photo. This kite has flown well in fairly light winds right through to somewhat fresh. The big Sode will get boosted high overhead if any thermals are around too! The Dowel Sode is something different that will always get a few interested glances from onlookers. Size? It's twice as wide as the 2-Skewer Sode, so that's 4 times the sail area. Compared to the 1-Skewer version, the Dowel Sode has 16 times as much area! Hope you enjoyed the pics and the info.